Park "Pepper" Adams is without a doubt one of the great voices of the baritone saxophone. Adams rejected the softer approaches of Gerry Mulligan and Serge Chaloff and came to the instrument directly from Harry Carney and Leo Parker with a rich, muscular sound that earned Adams the nickname, "The Knife". He graced many bands, Mingus,Kenton,Lionel Hampton and the great Thad Jones-Mel Lewis Orchestra. Adams' concept with his great sound and vast harmonic knowledge made his solos almost sound like compositions in themselves. Pepper always swung hard and inspired those around him to drive the music forward. 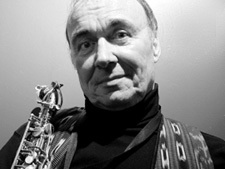 Pepper is heard tonight on an album recorded in August 1983 at "Fat Tuesday's" in New York with Canadian-born trumpeter Kenny Wheeler and an Adams' selected rhythm section with the great Hank Jones on piano, virtuoso bassist Clint Houston and Adams' Detroit buddy, Louis Hayes on drums. This fine quintet makes this album called "Conjuration" one of Pepper's finer later albums. Adams died of lung cancer on September 10, 1986 and the world lost one of the most individual and finest exponents of the baritone saxophone.